Abraham Lincoln, Illinois’ most famous resident, left his mark in locations throughout the state. Today, thanks to the Abraham Lincoln National Heritage Area (ALNHA) and its Looking for Lincoln Trail, you can retrace his steps and visit many of the places where he lived, worked. 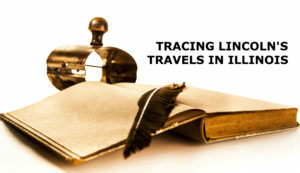 The Looking For Lincoln Trail focuses on the 30-years Lincoln resided in Illinois and includes 42 different counties. You can check out the various sites and locations on the organization’s website. Several points of interest, which we detail below, are located in the southeastern section of the state, making the Peace of Earth Lodge in Rushville a good base for exploring these. Beardstown is a charming enclave on the Mississippi River, and its here where you’ll find the Beardstown Courthouse where our 16th President argued many important cases. This is also the town where Lincoln was elected as Captain of his company during the Blackhawk War. Exhibits detailing the events are outside and accessible at all times of day. Further along the river is Quincy, a favorite spot of Lincoln’s and the site of the sixth Lincoln-Douglas debate. You can visit the debate site and check out the Lincoln-Douglas Interpretive Center, located in the center of town. If you have time, tour the home of Dr. Richard Eells, a famous abolitionist and Underground Railroad figure. Another pleasant stop along the way is Peace of Earth, an eco-friendly lodging accommodation in a restful country setting. It’s a good central location for visiting many of these historic sites. 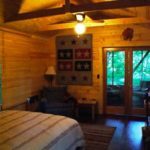 The lodge features three guest rooms, two cozy cabins—and a tree house! All stays include a delicious breakfast. In addition, Peace of Earth has a wonderful Outdoor Pavilion, perfect for weddings or gatherings. Peace of Earth is a member of the Illinois Bed and Breakfast Association … a unique lodging experience! This entry was posted in History, Illinois Bed and Breakfasts, Local attractions, Museums and tagged History, Illinois Bed & Breakfasts, Lincoln by admin. Bookmark the permalink.